It's not just iPhones that are blowing up these days, this Samsung Galaxy S II almost exploded in a man's pants. Seriously. Could you imagine if your phone caught fire and started burning everything in your nether regions? Ouchouchouch. According to an XDA-developer forum member, his friend first heard a sound and then felt a burning sensation on his leg. Acting quickly, he pulled everything from his pockets and saw that his Galaxy S II was smoking. 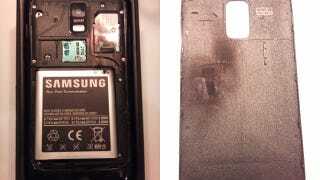 You can see the burn damage near the battery and SIM card port. You wonder what kind of damage could have happened if he didn't move quicker.